In many organizations, learning initiatives, in any of their manifestations, are becoming increasingly recognized as value-adding activities. However, what is often lacking in companies is a deep understanding of how learning can be a strategic driver of sustainable success. Roland Deiser’s new book illuminates this understanding with clarity and insight. Competitive success —if not the very survival— of most of today’s organizations is increasingly dependent on their ability to innovate, learn, and change on an ongoing and sometimes radical basis…Thriving in this context is particularly challenging for large and global players that usually struggle with the structural symptoms of the “elephant disease:” high organizational complexity, bureaucracy and inertia, political infighting, a culture of silos, slow response time and more. Most senior leaders are keenly aware of these challenges; they know their organizations need to learn new capabilities…But developing this level of responsiveness and agility is not easy. It requires, in fact, …a new approach to capability development itself…a radically new paradigm of corporate learning and development. In chapter 1, The Future of Leadership, one article discusses the changing nature of leadership and presents the new skills leaders must have to make sense of disruptive trends and chaotic events (a theme that SyNet consultants strongly agree with). Other essays explore how to design responsive organizations, how leaders must capitalize on social media, and how to harvest the benefits of communities of managers. Case studies are presented about GE and W.L. Gore & Associates. In Chapter 4, Making Innovation Happen, three essays expound on how learning drives innovation and transformation, and four case studies demonstrate successful examples of this at Cisco, UniCredit Bank, MBDA, and ST Microelectronics. (This chapter reinforces the approach that SyNet’s Innovation Lab curricula take in helping our clients discover new ways to instill innovation in their people). In Chapter 9, Smart Initiatives that Make a Difference, a dozen case studies show how L&D participated in developing new skills for an organization’s leaders or assisted in overcoming various culture and organizational challenges. Companies profiled include ThyssenKrupp, Fiat, L’Oreal, EADS, ERGO, EnBW, Roca, Credit Suisse, Ericsson, and UBS. In Chapter 10, What We Can Learn from Silicon Valley, Deiser offers a synthesis of 20 critical factors that coalesce to make this region the premier center of global innovation, imagination, and entrepreneurship. The chapter is based on a trip to Silicon Valley which Deiser led for 20 senior L&D executives from major global corporations to investigate the dynamics of this eco-system of invention and the future of business. Transformers is not simply a book of essays; it is beautifully-designed, using graphics, photos, and artwork that highlight the ideas Deiser presents and provide visually strong imagery to reinforce the information. The leadership of SyNet highly recommends Transformers to our colleagues involved in corporate L&D, as well as to the C-suite executives in our client companies who are serious about improving their understanding of the learning function and how their own organization’s L&D group might become a critical enabler of agility and competitive advantage. 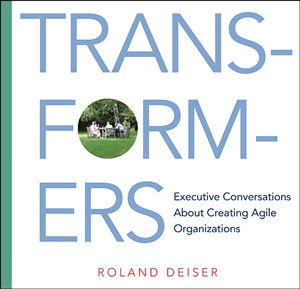 We congratulate Roland Deiser for this exceptional book as we believe it makes a strong statement for how consulting companies like SyNet can make a key strategic contribution to building agile organizations.